Les Claypool has always reveled in being a weirdo. Whether it's with Primus, or any number of side projects (Sausage, Frog Brigade, and countless others), he's never been shy about putting himself out there. Now he's back with a banjo-focused outfit, appropriately named Duo Twang. That group has just released their debut record, Four Foot Shack. 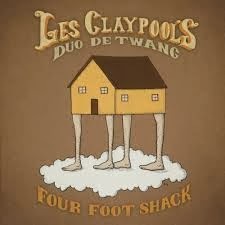 To say that Four Foot Shack is an uneven album would be an understatement. "Buzzards of Greenhill" is a strong effort, with the banjo substituted for Claypool's usual basslines, it excels in the hillbilly format. Other tracks don't fair nearly as well. "Amos Moses" is a complete mess of an arrangement. Cuts like "Boonville Stomp", "Pipe Line", and "D's Diner" are simply monotonous. Let's face it though, what's going to draw in the listeners are the better-known covers, be they covers of other people's work, or re-workings of familiar Primus tunes. The speedy "Stayin Alive" keeps a taut time. It also manages to preserve the song's disco/funk essence throughout the transformation. Less recognizable is the duo's cover of Alice In Chains' "Man In The Box", which is more of a curiosity than something you'd listen to regularly. The country & western of Stompin' Tom Connors' "The Bridge Came Tumblin' Down" provides a fantastic oater moment and something for Canadian fans to latch onto. In terms of the Primus songs, "Wynona's Big Brown Beaver" becomes oddly mechanical when given this banjo treatment. "Jerry Was a Race Car Driver" becomes a break-neck, mostly instrumental number that does not do justice to the original. At the end of the day Four Foot Shack should be acknowledged for what it is: a novelty record. That novelty would probably have been more effective and engaging if Duo Twang has stuck to the covers and Primus ditties. Best tracks: "Stayin Alive", "The Bridge Came Tumblin' Down"